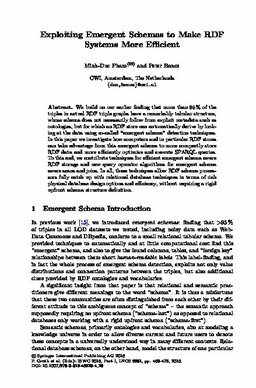 We build on our earlier finding that more than 95 % of the triples in actual RDF triple graphs have a remarkably tabular structure, whose schema does not necessarily follow from explicit metadata such as ontologies, but for which an RDF store can automatically derive by looking at the data using so-called “emergent schema” detection techniques. In this paper we investigate how computers and in particular RDF stores can take advantage from this emergent schema to more compactly store RDF data and more efficiently optimize and execute SPARQL queries. To this end, we contribute techniques for efficient emergent schema aware RDF storage and new query operator algorithms for emergent schema aware scans and joins. In all, these techniques allow RDF schema processors fully catch up with relational database techniques in terms of rich physical database design options and efficiency, without requiring a rigid upfront schema structure definition.